Your skin cancer and skin care specialists are celebrating 30 years! As president and medical director of Associates in Dermatology, Dr. Michael Steppie has built a leading dermatology practice, with 15 convenient locations located throughout Central Florida, including one in Apopka. Dr. Steppie is a board certified physician who has completed residencies in internal medicine, dermatology, and dermatologic surgery, and is an experienced Mohs micrographic skin cancer surgeon. The Mohs micrographic procedure is the most precise method available to remove skin-cancer tumors, which can have difficult-to-detect roots that spread into the skin, along blood vessels, nerves and/or cartilage. It is the surgical technique that offers patients who have skin cancer the most minimal recurrence rate, in addition to maximum preservation of uninvolved tissue. He and his experienced team of dermatology providers take great pride in providing the most positive patient outcomes. “Whether we are treating skin cancer or caring for a wide range of skin conditions, our staff puts the patient first,” says Dr. Steppie. Over the last 30 years, Associates in Dermatology has been performing surgical excisions of melanoma, skin tumors, cancers, benign moles and skin lesions, but it also offers a number of general dermatological therapies. Common conditions treated in Apopka include allergic dermatitis, psoriasis, acne, eczema, and diseases of the hair and nails. The practice accepts most health plans and treats patients ages five and up, so feel free to call and schedule an appointment for you or your loved ones! 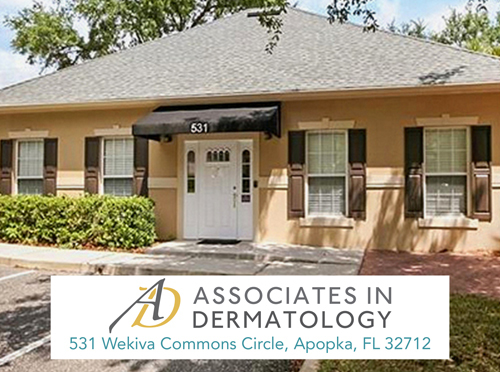 Associates in Dermatology’s Apopka office is located at 531 Wekiva Commons Circle, off Lake McCoy Drive, east of Apopka Middle School.